As the weather turns colder, the days grow longer, and the tummy starts to get an insatiable urge for apple cider, pumpkin flavored anything, you’ll undoubtedly notice the kaleidoscope of leaves falling to your yard. As picturesque as the leaves are this time of year raking them is a chore (one made worse when your NEIGHBORS leaves blow into your yard…again!!). Stay in shape. Being in better physical fitness will dramatically reduce the effort raking produces. Talk to your healthcare provider if you have any pre-existing health conditions as raking leaves can be strenuous and take a physical toll. Get others to help, breaking the job into smaller tasks will make it easier on everyone. Warm up before starting to rake, get your body ready to exercise and work first. Just like going for a workout you should warm up before raking the leaves. Use the right rake for the job. The handle should be chin height, and your hands should be able to hold the rake 18″ to 24″ apart, too short and you can hurt your back; too heavy and you can strain your shoulders and neck. Layer up. Wear layers of lightweight clothing to accommodate both the changing weather and your body temperature as you rake more. Wear gloves to prevent blisters. 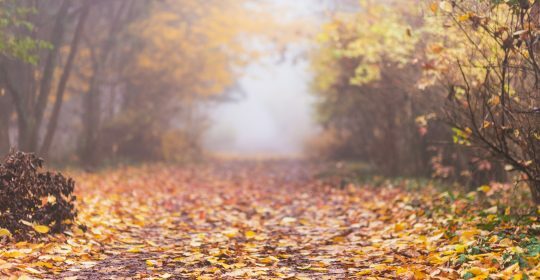 Wear shoes/boots with good traction as leaves can be slippery, dry or wet, and could cause a fall. Hold the rake handle closer to your body to help maintain a more upright posture while raking. Bend at the knees with one foot ahead of the other instead of bending at your back. Don’t twist. It’s better to move the legs and pivot the body by shifting your weight instead of planting your feet in a fixed position and raking in several directions from that position. Changes sides and alternate hands frequently to balance the work load on your body. Be careful not to overstuff the bags. Remember wet leaves weigh more, so pack fewer leaves in the bags when they’re wet. When moving the bags, make sure to lift with the legs – bend the knees and keep your back straight and stomach tight. (If you’re not sure about the proper lifting mechanics, check out this newsletter that breaks it down in greater detail). If a bag is large and awkward to lift, walk backwards pulling the bag, or use a handcart or dolly to move it. Following some of these simple steps will help you get the yard cleaned up, looking real nice, decrease your chance of injury, and allow you to enjoy the fall weather and beautiful colors…..that is, until the wind blows your neighbors leaves into your tranquil space. Remember to stretch after you finish!